I received a "You make my day" award from both Carrie and Wendy!! Wow!! I'm so honored. 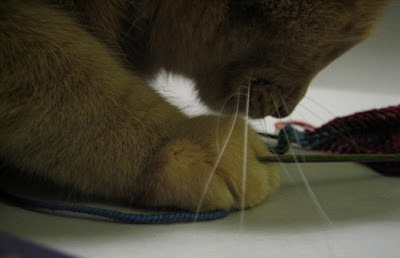 I'm tickled that you enjoy coming around and checking out the We Heart Yarn neighborhood! Thank you so much! 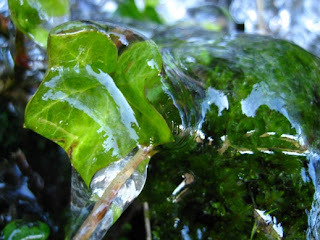 It's so hard to choose just 10 blogs...there are so many that bring a smile to my face and inspire me. 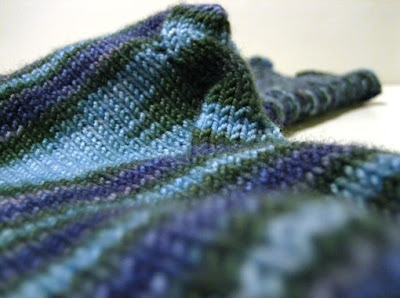 Black Dog Knits: I am in awe of all the beauty Nora creates and she makes it seem so extraordinarily effortless. 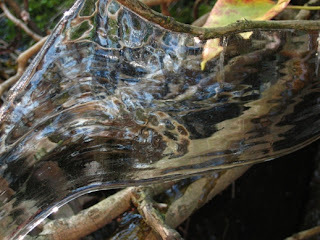 Her photographs will stop you in your tracks! We Do Not Have a Knitting Problem: Smiles galor, great knitting, wonderful energy...and how fun that I actually got to meet her a couple of times while she was in PDX! 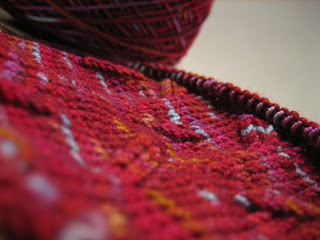 Rani Knits: I heart her! She cracks me up. 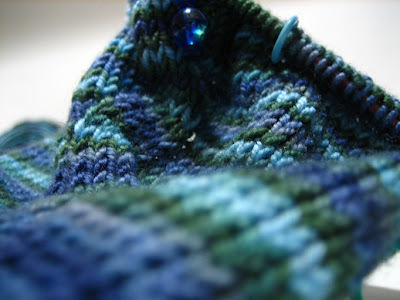 Her knitting is fun and varied and she has an exceptional attitude. And of course, it's the home of Leo! Knitguy: Have you seen his spinning?? OMG! Go now. And he's tres funny. 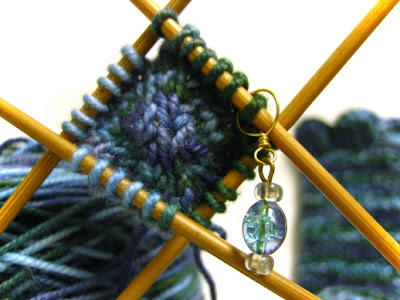 Stitch Marker: Beautiful photography, lovely knitting and I so enjoy reading about her world. Wendy Knits: She has been a near daily read for quite a few years now, I love following all of her knitting projects and Gibson loves following sweet Lucy!! 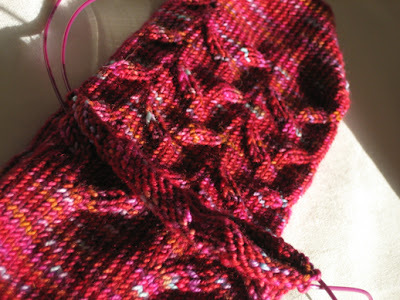 Knitspot: I can't wait for the next bit of gorgeousness to emerge from her needles, and her generous booster campaign in support of Claudia's MS150 ride really made my day! Claudia's Blog: Her MS150 ride brought me in to her blog, her knitting and writing have kept me there! 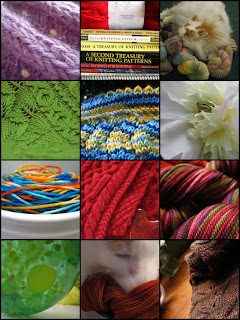 Woolgirl and Twisted for inspiring me to...well...shop! You are fiber-pushers extraordinaire! Now go on and make the day of 10 other people! The gift that keeps on giving!! Briefly, the second SSS is almost completed. 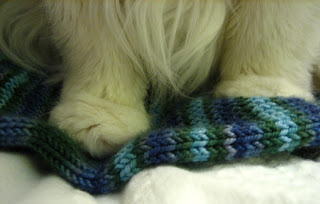 I have 3 pattern repeats on the leg and the edging left to knit. 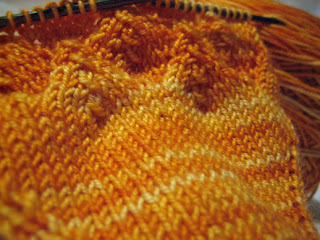 It takes me approximately 30 minutes per pattern repeat plus maybe 30 minutes for the edging and bind-off, I estimate 2 more hours of knitting time and I have 3.5 3 hours left of the day. 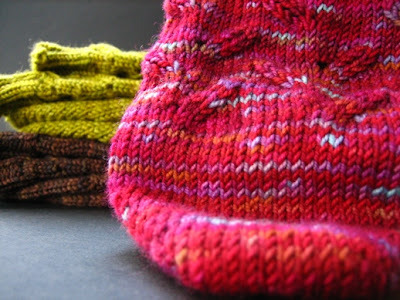 I am determined to finish a pair of socks by the end of the month! TTFN! p.s. 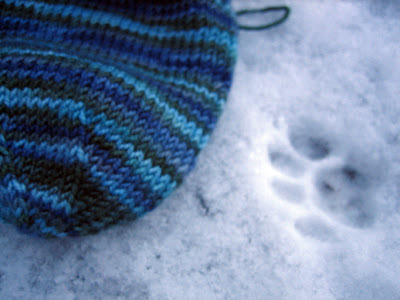 The kitty paw print in the snow was left by Theo, our neighbor's cat. He was helping me with the photoshoot! ETA: SSS are done!!! With 30 minutes to spare!! The sun wasn't even up yet when the Salish Sea Socks went out to play. Play is good for the sole. We went over to my parents' home for dinner Saturday night. My sisters did the majority of the cooking. 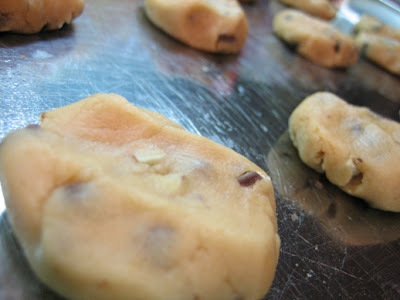 Good thing for us, as they like to bake. Case in point. 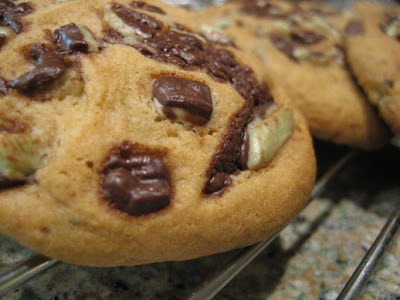 Chocolate chip cookies with Chopped Andes mints substituted for regular chips. Oh. Yum. 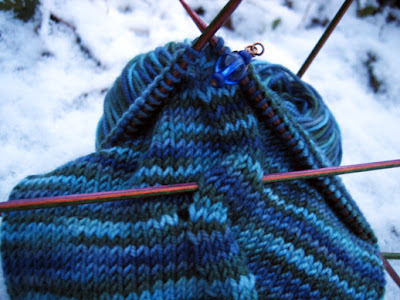 A small amount of knitting was accomplished over the weekend. 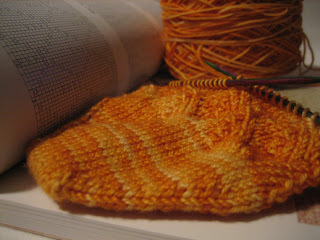 The proverbial heel has been turned on the second STR Rare Gem Teosinte sock. The shadows you see are natural...i.e. from the sun. Really. 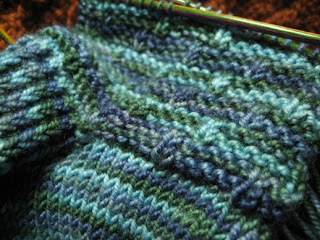 The second Salish Sea Sock is gently lapping at my toes...no swells in sight. Rapidly being followed by the second. I guess it's its growing season!! Hmmmm...what is that? 'Twould be a ball of wound up STR Sunspot...Any guesses on what it might turn into??? The better question would be, any thoughts on what it should turn into?! 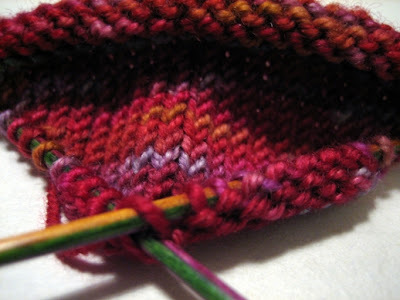 I bet you think this is the beginning of the second Teosinte sock, don'tcha'? Nope. It's a Max toy! 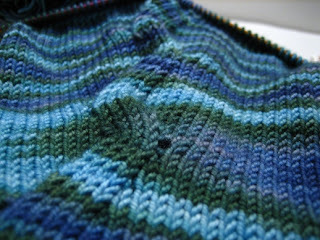 Susanne asked about the countdowner to the Autumn equinox in the sidebar...I'm a dyed in the wool Fall/Winter girl...I can't wait for the Fall to reappear...autumn leaves, crisp air, fresh apples, steaming hot cocoa, heavy wool sweaters, wearing of all my handknit socks...I'm giddy already and I have 248 days to go!! Progress is slow, but certain. One Salish Sea Sock is finished. The second one is just a ripple. I have Max purring in my lap as I'm typing this, a steaming cup of apple cider at arms reach, the virtual-company of a friend via almost real-time email :), Mr. NK is happily working on his wooden kayak (which should be launching this summer...stay tuned)...could one really ask for more? I hope your Saturday is as blissful as mine! I suspect I've won the battle, but not the war! I was lucky, Gibson seemed to be quite enthralled with a new ballerina on the scene the other night, leaving me time to get a few shots of my Salish Sea Sock progress in his temporary absence! 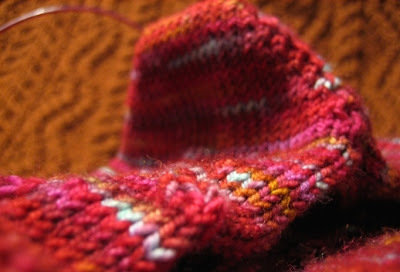 The heel has been turned and I'm making my way up the cuff of the first sock. 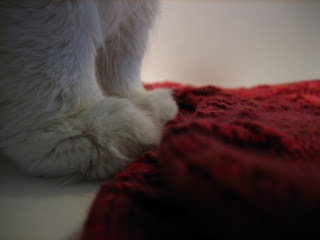 I must thank you all for your kind words...I'm so glad I'm not the only one that goes completely gah-gah for cute kitty feet!! In my vocation, we have things called biomarkers. 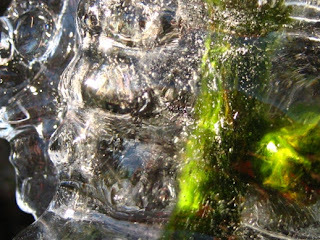 These are biochemical indicators, or landmarks, which are tightly linked to some underlying process, e.g. a particular disease or a response to a drug intervention. If we detect the presence of a particular biomarker, we then can make a prediction about what's going on in the organism. We have a biomarker here at Chez NK. His name is Gibson, and the specific biomarker is kitty hair...white kitty hair to be exact. When I peruse my photos after downloading them, it's always the photo with the kitty hair that I want to post to the blog! LOL. The problem is, I never see the pesky hair until the darn image is enlarged on the computer monitor. Even those sticky lint rollers don't get it all off, there is always one remaining...resistance is futile. I could not get him off that Salish Sea Sock for the life of me...I figured quality time with him being très cute (look at those feet!) 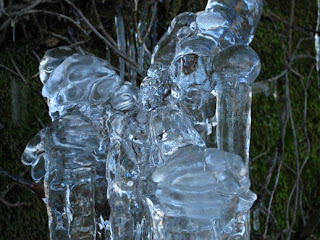 outweighed a pic for the blog...this time. 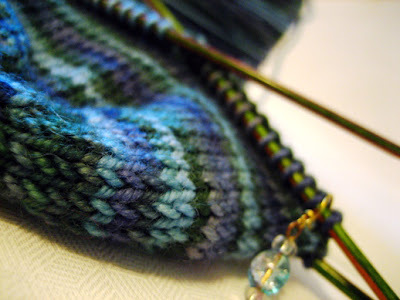 I'm just a repeat away from turning the heel...but wait...there's a problem. Back at the toe! Ack! One extra row between pattern motifs. 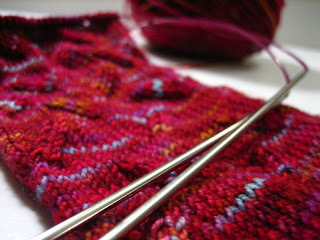 Good news is the foot has since been knit back up and I'm poised to turn the heel when they next enter the rotation! That was a close call. I hope your Saturday has been less perilous! This commercial is brilliant! It makes me smile! 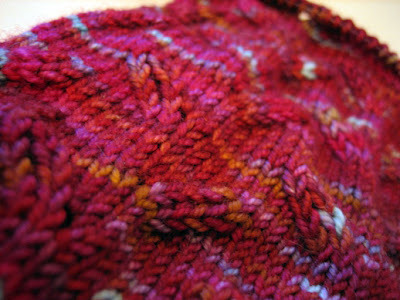 I heart distributing cabled sweaters to the family during chilly weather. Do you think he knit them overnight? A girl can dream! Truth be told, I just heart Sven! 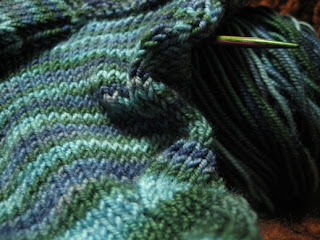 I love the curves on the instep of the Salish Sea Socks. Is it a bird? Is it a plane? No...it's a Teosinte!!! 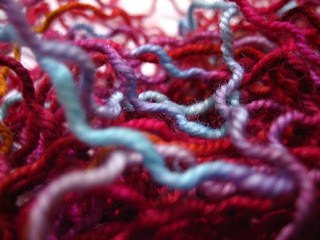 Knit from a skein of STR 'Rare Gem' aka Gail's Hair as seen here! And yes, I've added some blue to my hair along with the pinky hues. Sassy! 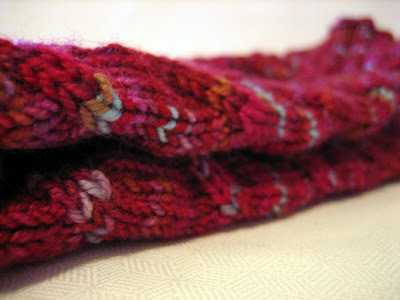 We had fun: Forty two-and-some-change socks were knit! We were top down; we were toe up! One baby blanket was designed and knit. Picots totally ruled!! My Red Aran sweater design went public. Shawls were started. Gibson!! Autumn leaves. Reds. 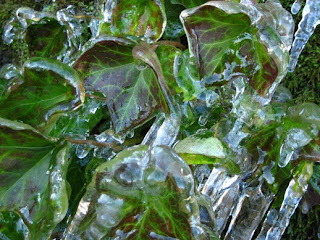 Greens. Pinks!! Golds. Blues. 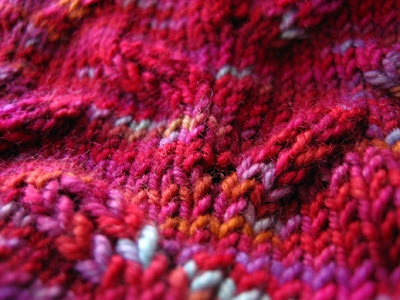 We joined: Rockin Sock Club 2007, Summer of Socks, National Blog Posting Month, Ravelry. We cried: Virginia Tech. The passing of a mother of a friend. Bridges. Angel-Heidi. Floods. A beloved singer-songwriter silenced. We supported: Claudia's fantastic ride for MS! Rose's memorial walk for Pat and ALS. Prostate Cancer. We celebrated: Anniversaries. Kayak building. Beach trips. Birthdays. 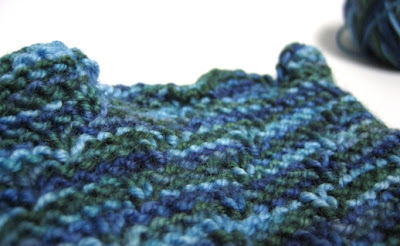 Baby hats were knit and their recipients were born. Marriages. We are so proud of Jen, and Shannon and Emily who are following their dreams. New friends, and old friends!! 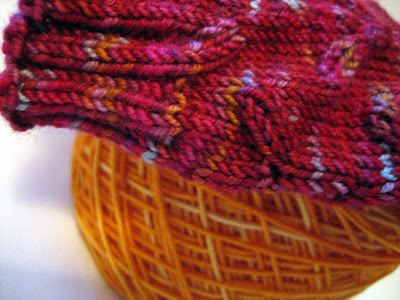 Thank you so much for stopping by We Heart Yarn! Your comments and support are appreciated so very much. 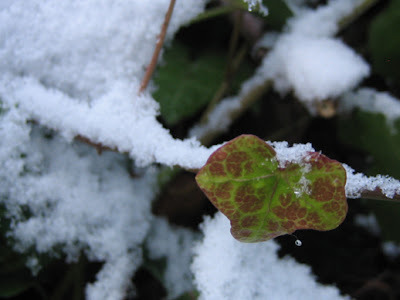 We wish you a very Happy New Year and hope your 2008 is filled with love and joy, good health, a never ending supply of fibery goodness, and peace.